Michael Edelson is a lifelong student of martial arts with over 30 years of experience. 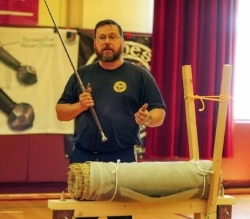 He is a world-renowned practitioner and teacher of Historical European Martial Arts (HEMA) and is the founder and principal instructor of the New York Historical Fencing Association. He is best known for his work in body mechanics and cutting, and teaches seminars and workshops on these subjects in North America and Europe. An unprecedented study of the body mechanics of the sword, written by a world-renowned expert in Historical European Martial Arts. Full color with detailed illustrations. For centuries, masters of defense throughout the world jealously guarded their knowledge, sharing it only with their students and patrons. But it was not just their techniques that they wanted to keep hidden—their most closely guarded secret was not what to do with a sword, but how to do it. This book lays bare the principles of the use of the sword with unprecedented detail—principles that are universal across nearly all cultures and time periods, including our own. This information comes from centuries-old living lineage martial arts, medieval fencing treatises and decades of combined research, experimentation and application. It is accessible to anyone, from a complete beginner to a seasoned expert. The path to mastery consists of small steps, each easily understood and taken. There is no magic or mystery in the use of the sword. There is only the art, and it is an art created by and for human beings, utterly attainable and without artifice or embellishment. Using clear and concise explanations and highly detailed illustrations, this book takes you step by step through the body mechanics of the sword, from foundations to essential elements. It is divided into three modules: Theory, Practice and Calibration. The Theory module thoroughly explains all of the underlying concepts and principles and how they combine to create something greater than the sum of its parts. The Practice Module provides advice on choosing training equipment as well as a comprehensive array of drills and exercises designed to put everything you learned in the previous module into practice. Finally, the Calibration module gives you all of the information you need to put your skills to the test by cutting targets with a sharp sword, from advice on choosing a sword to how to purchase, prepare and set up tatami and other targets. Most importantly, it will teach you to interpret your results in a way that will inform your training and allow you to correct errors and improve your technique. Whether you are taking your first step or the latest of many, let this book be your guide.